When I visited the Natural Products Expo last month I was able to meet with Wyman’s of Maine. I love to support any company that is privately owned by family. Headquartered in Milbridge, Maine, Wyman’s of Maine has been harvesting locally grown blueberries since 1874 to provide to their customers. Wyman’s sent me a wide variety of berries including what they’re most known for, their delicious blueberries. So, I thought a great summer recipe that would be fun for moms and kids would be perfect to really showcase this great company and the products they offer to all of us! These triple berry peanut butter granola yogurt popsicles are perfection! Try different combinations of berries to make the ones your kids will love! Blend Wyman’s frozen blueberries and frozen spinach together in blender. 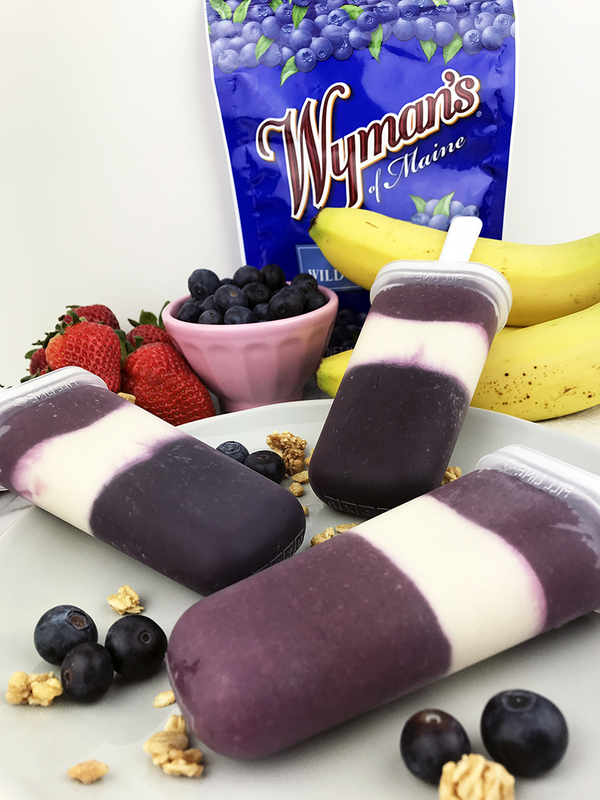 Blend Wyman’s frozen mixed berry blend (blueberries, strawberries & bananas) in blender. Mix greek yogurt, honey and peanut butter granola clusters in small bowl. Blend in blender. Using popsicle molds fill each mold with the 3 blends as desired. We have layered them as such: 3 tbsp blueberry/spinach blend, 2 tbsp yogurt blend and 2 tbsp mixed berry blend (alternating flavors/colors as desired). Insert sticks and covers onto mold. Freeze overnight. Remove from freezer. Enjoy!!! Wyman’s of Maine has a strong commitment to sustainability, food safety and premium quality. Wyman’s owns land in Maine and Canada. The Wyman’s farm team manages over 17,000 acres of wild blueberry fields. Many local wild blueberry farmers in Maine and in the provinces of New Brunswick, Nova Scotia, Prince Edward Island depend on Wyman’s to manage their lands and/or to process and market their harvests. Cool Fact: Wild blueberries grow from a naturally occurring root system indigenous to Maine, the Maritimes and parts of Quebec. This rhizome system spreads like a carpet and has a two-year growing cycle. After cropping, the land is mowed and the mulch left on the ground as compost. Wild Blueberries are better than cultivated blueberries because they offer better taste, nutrition, color and more! Wyman’s makes eating healthy easier for you and your family with high quality fruit that tastes as good as the day it was picked. Their berries are perfect for smoothies! As a family-owned business for the last 140+ years, Wyman’s is committed to the quality of what they put in every bag. Wyman’s does things the right way: respecting others, protecting the land/wildlife (bees), having a strong work ethic, commitment to farming, and using sustainable practices. Wyman’s embraces its wild Maine heritage and applies those values and mindset (hard work, common sense) to everything the company does. Where to Buy: Wyman’s is carried at major retails such as: Walmart, Safeway/Albertsons, Kroger, Whole Foods, Sprouts, Hannafords/FoodLion/Stop & Shop, BJs, Target, Midwest Costco. 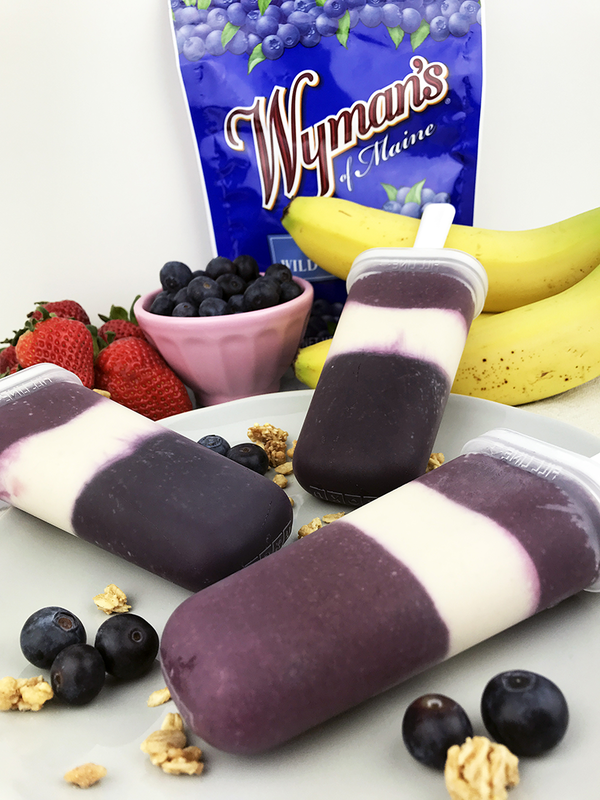 Wyman’s products are absolutely perfect for smoothies! What’s your favorite kind of smoothie?